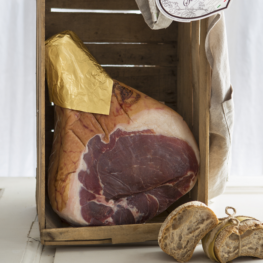 Since Grandfather Giovanni’s day, every single Prosciutto Prolongo has been cosseted from the start of processing. We put quality before quantity. That’s why you will find Prosciutto Prolongo in quality-conscious restaurants, good food stores, wine shop sand delicatessens. 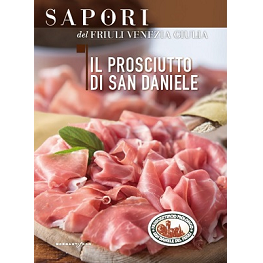 Our e-shop gives everyone an opportunity to taste a genuine Prosciutto di San Daniele. Select your favourite package and share it with your family, your friends and other loved ones. Follow our slicing and serving suggestions to enjoy a unique sensory experience. 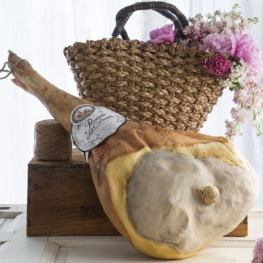 If you wish, share your Prosciutto Prolongo taste experience on our Facebook page. 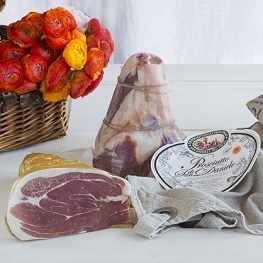 Bone-in Prosciutto is considered the connoisseur’s choice. 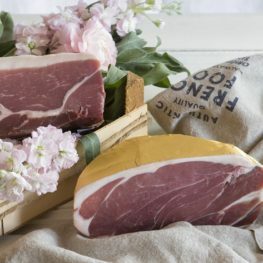 Savour the refinement of hand-sliced Prosciutto and enjoy its full flavour. If this is your first purchase, do follow our slicing suggestions. * price indicative as product is sold by weight. Do you want to make a gift to someone special? 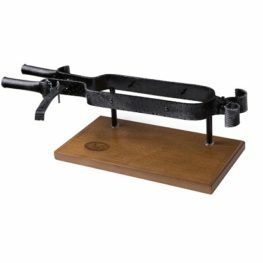 If you have a meat slicer, the best way to enjoy Prosciutto Prolongo is in thin slices. Follow our suggestions for optimum results. 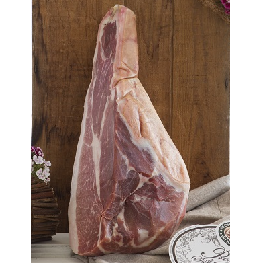 Purchasing half a Prosciutto Prolongo is the perfect solution if you think a whole one is too much for your requirements. The milder and more delicate trotter end of the ham. A small cut, ideal for one or as an ever-welcome gift. A hock with the rind removed, ready to be sliced and served. 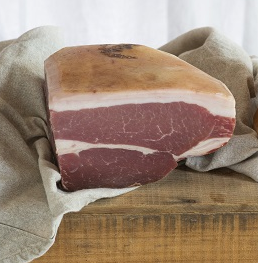 Choose a practical portion of Prosciutto with no rind and no waste. 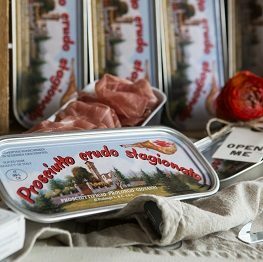 The traditional tin that was once popular in San Daniele del Friuli. 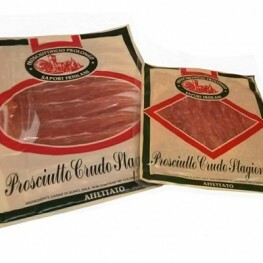 Ready-sliced Prosciutto Prolongo in a practical pack that keeps the product fresh for longer. 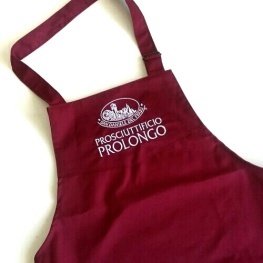 A sumptuous apron embroidered with the Prosciuttificio Prolongo, the prefect garment to add a touch of refinement to your kitchen. 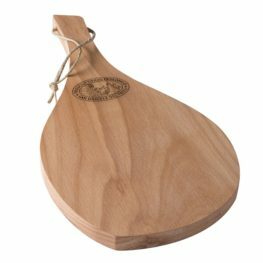 (IT) Un simpatico tagliere in legno che richiama la forma del Prosciutto, impreziosito con il marchio a fuoco del nostro logo. 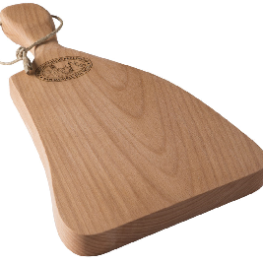 A delightful wooden cutting board in the shape of a Prosciutto, fire-branded with the Prolongo logo. An elegant long-bladed knife, ideal for hand slicing. 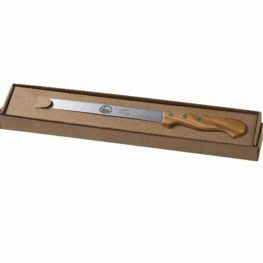 Discover how good you are at slicing Prosciutto or give the knife with Prosciutto Prolongo to make a genuinely impressive gift. 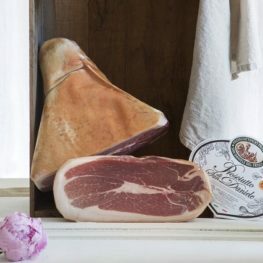 (IT) Una raffinata morsa in ferro battuto è il giusto supporto che non può mai mancare per valorizzare al meglio il Prosciutto con osso Prolongo.